When the third president of Ohio University, Robert G. Wilson, gave his inaugural address on Aug. 11, 1828, he outlined the importance of each subject to an education. He stressed how important it was to “rouse the native energies of the mind” and told the crowd about why students should still learn the dead languages, according to a transcript of his speech. Nearly 200 years later, Duane Nellis, OU’s 21st president, presented his main goals at the convocation for first-year students on Aug. 27 — goals that strongly differed from Wilson’s speech while sharing the same message about the importance of a university education. Throughout the university’s history, presidents have delivered a variety of inaugural and convocation addresses, each tailored to and representative of the differences in leadership over the years. President Duane Nellis spoke to the incoming freshman at the Convocation Center Sunday prior to the Involvement fair on Campus. Some topics, such as the importance of individualized education, carried through speeches throughout time, but as university presidents faced a variety of problems and circumstances, their speeches changed with them. When Roderick McDavis, the university’s 20th president, spoke at his inaugural address on Sept. 10, 2004, he outlined his goals of making OU a prominent university, increasing diversity, securing national resources and increasing relationships in the area. Decades earlier, when John Calhoun Baker stepped up to speak during his inaugural address on May 11, 1945, OU’s 14th president had more to address than just university goals. During his tenure, he also had to face the aftermath of World War II. He highlighted four points that he thought should be the goals of higher education: development of character, training for citizenship, careers and leadership, and leisure. “When the history of this period is written, we will not be judged by the variety of courses offered, by educational fads adopted, by the number of students enrolled, nor by the attractiveness of the buildings, but by the quality and character of our graduates and their contributions to society,” Baker said in his inaugural address. Thirty years later, on March 6, 1976, Charles J. Ping, the 18th OU president, delivered an inaugural address that one university benefactor said was so good that he thought it should have been redistributed to every university president in the country, according to a March 8, 1976, Post article by Joe Kay. In his address, Ping emphasized the importance of professional development and the university’s place to teach both to large groups and to each person. That devotion to individualized teaching and providing education to a large group of people was present in many speeches, including Vernon Alden’s inauguration as the 15th OU president. Alden said in his May 11, 1962, inaugural address that he wanted to cast a “wide admissions net” and also hoped to push “ill-prepared, poorly motivated individuals” in addition to challenging the “outstanding student.” That is why one of his proposals included the creation of a full honors college, and an increased number of doctoral programs. 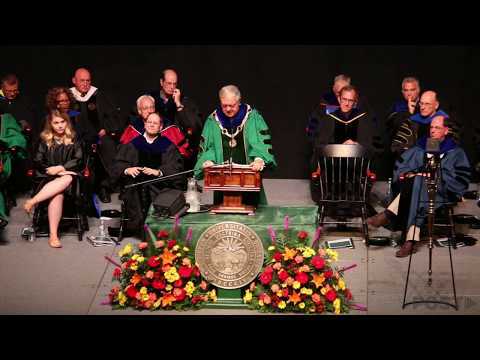 On Oct. 1, 1994, Robert Glidden, OU’s 19th president, quoted Alden, Ping and Harry Crewson, president from 1974-1975 in his speech, which centered on change both in the world and at the university level. He described how OU should prepare students for change in all aspects of their lives and how professions increasingly demanded advanced skills and knowledge — which is why he believed university research was so crucial to the university and why he also hoped to address the needs of southeast Ohio and Athens. “Universities address change in nearly everything we do,” Glidden said in his inaugural address. The plans for each incoming OU president are no different.